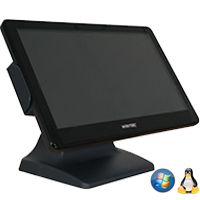 The AnyPos 600 Series POS is a newly developed 15″ touch terminal. With iButton, fingerprint reader and thermal printer, it can meet all demands on the high-end market. 5 wire resistive touch screen and projective capacitive touch screen are both available. A waterproof screen makes it workable for harsh environments. The AnyPos 600 Series POS is a newly developed 15″ touch terminal. With iButton, fingerprint reader and thermal printer, it can meet all demands on the high-end market. 5 wire resistive touch screen and projective capacitive touch screen are both available. A waterproof screen makes it workable for harsh environments. With an industrial motherboard and aluminium housing fanless design, AnyPos 600 is ideal for hospitality, retail, kiosk, healthcare, c-store, petroleum, grocery and other segments.